"Mata Hari was executed for espionage during WWI." 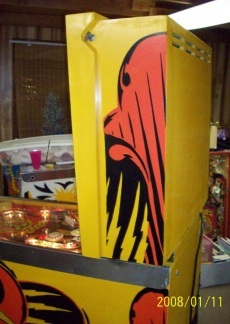 Mata Hari was one of the earliest solid state games made by Bally and was very popular. It has chimes as it was designed before electronic sounds were added. Despite the fact that it has a totally symmetric playfield layout and very simple rules, it happens to be one of my all-time favorite games to play. There are basically three goals you try to accomplish. One, knock down the drop targets. Two, complete the A-B combination a certain number of times. Three, land in the sloping saucer multiple times. Yet, even though the goals are simple, this game is addictive. For me, it’s like every ball is an “almost” great ball. I almost knock all the targets down or almost light the extra ball by completing the A-B combination six times or I almost advance the bonus multiplier by landing in the saucer. For this reason, it keeps you coming back for more. The game is famous for its backglass and depiction of Margaretha Zelle, an exotic dancer who was executed as a spy during WWI. There are two versions of the backglass. In the more popular version, the dagger has the inscription "Meine Ehre heißt Treue" (German, "My honor is loyalty"). This inscription was the motto of the Waffen SS troops in WWII and was adapted from a statement made by Hitler in 1931. Thus, it has no real connection to Margaretha Zelle. Contrary to popular belief, the version with the inscription on the dagger is NOT more rare than the one without. There were about equal numbers of backglasses made each way. The cabinet on this game was in fairly good shape. In fact, of all the games I have restored, it was probably in the best over-all shape except for the Xenon. I probably wouldn’t have repainted the cabinet except that one side had a giant scrape down the length of it. It was probably the result of the fact that when the game was shipped it was strapped together with two other games and they probably “rubbed” during shipment. As for the electronics, I had to rebuild the power supply and all of the connectors on the various boards. There were some reset struggles that I explain about in the detail pages. As for the playfield, it was rough. It was so bad that I ended up buying a replacement. I was able to find a decent replacement at a very good price. I touched up the replacement and then clear-coated it. 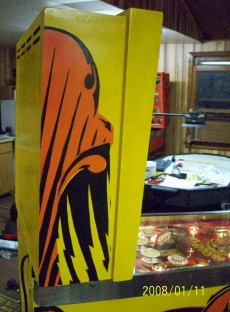 This was my first attempt at clear-coating a playfield. After seeing the final results, I wish I had done it on my previous restorations. I detail the process on the playfield pages. One note, some of the pictures aren’t as of good quality as I would have liked. My digital camera broke in the middle of the restoration. Actually, we unknowingly dropped it at one of my sons’ basketball tournaments and ran over it with our van:) So, some of the pictures were taken with our video camera which doesn’t have as good of a resolution. (This was done long before the days of high resolution cameras on every phone).